There is something about Grant that makes me laugh. He always seems to know when he "shouldn't" go to bed. He is usually really good about it, but once in a while he does not go down easily. For instance, last week I put him down and started to make cookies. 15 minutes after putting him down, he was ready to be up again. So I let him stay up for a few more minutes, while I finished baking (he is a lot like me, and loves cookie dough too... though he doesn't get it that often). Last night was one of those night, where he didn't want to go down. I went into his bedroom and got him up. He helped me a little in Cami's room, and then I had the thought... While we were in Utah we bought some fireworks, and still had them!! We didn't go see the 4th of July fireworks this year, and so I asked Mark to grab a few. 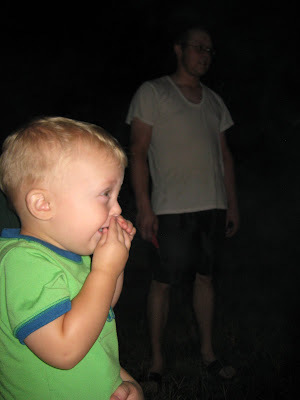 We headed outside for Grant's 1st experience with fireworks... His face above says it all! 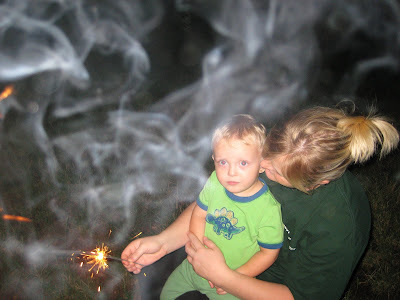 He wouldn't touch the sparkler. He did, however, think that they were pretty cool. 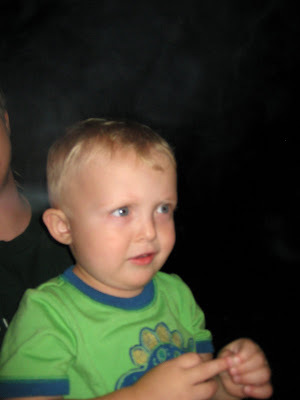 I guess I am ok with the fact that he isn't excited to touch or play with fire! It was fun, and right after he went to bed!! I am so glad to have these fun moments with my family!! Ron is a sparkler king. We always have sparklers at our house. I love his face in the middle picture!